This month we begin a new monthly column in which we will highlight some of Library’s most important (and occasionally enjoyable) online resources that all students should know about. The goal is to provide very brief introductions to sites on the Library website that will help you research faster and more effectively. Summon is a kind of search engine purpose-built for academic libraries. 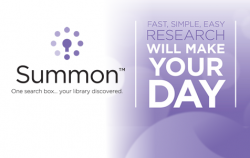 Summon allows you to search almost all of the Library’s holdings and locate items such as full-text journal and periodical articles, books and ebooks, dissertations, AV and streaming video, and more. Summon is able to search millions of records and locate highly relevant resources for the researcher thanks to the intuitive filters on the search screen. Unlike a web search engine like Google, where the trying different keyword combinations is the only way to locate what you are after, with Summon the filters allow you to start from the initial (usually enormous) search results and telescope into the articles, books, and videos you are really looking for. Summon is a great place to begin any research project because it searches easy-to-overlook databases and e-book collections. Ready to get started? Click here to try a few searches, or view the short video tutorials first on our Summon Quick Guide. While Summon is not an answer to every research problem, it is a powerful tool that can generally find the right resources for completing your projects. For questions about Summon, contact us by phone, email, text or chat. This entry was posted in Deeper into Databases and tagged online research, ProQuest Summon on September 7, 2018 by Harold Henkel. On Tuesday, January 17, the Regent University Library celebrated the official roll-out of its new discovery tool, Summon. A discovery tool simplifies the search process by enabling you to search for books and e-books from the Library Catalog and journal articles from most of our databases in a single search. You can find the search tool in the center of the Library homepage. It is the simplest way to launch your research. We hope this is the beginning of a long and happy relationship with our new discovery tool and that it will improve your research experience. If you have any questions about Summon, a friendly librarian will be happy to assist you. You can also check out a brief tutorial video on our Summon research guide that will introduce you to the powers of this tool. Disclaimer: Summon is a great tool that will connect you to many resources, but do not discount the importance of searching individual subject databases. Summon is not intended to be your sole research source! This entry was posted in Deeper into Databases, News Features and tagged Discovery, ProQuest Summon on February 4, 2017 by Harold Henkel. The Library has a subscription to a premium discovery tool from ProQuest. Summon’s filters and limiters allow you to search millions of items on your topic and zero in on the most relevant books, articles, and videos in the Library’s collections. After watching this short tutorial, you will be ready to take Summon for a test drive. Click here to get started. As always, the Library welcomes comments and suggestions about our electronic resources. Please use our evaluation form to send feedback about Summon or any of our databases. This entry was posted in Deeper into Databases, News Features and tagged Discovery, ProQuest Summon on August 5, 2016 by Harold Henkel.